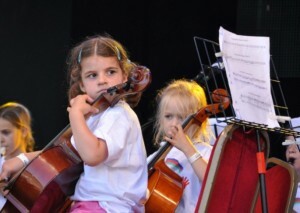 The top musicians of tomorrow showed their young potential as a series of four concerts at Victoria Park Haywards Heath opened on Thursday 18 July, 2013. Youngsters from schools all over Mid Sussex played on the large stage in the Schools Aloud concert on a warm evening. This was the debut performance of the Central Mid-Sussex Schools’ Community Interest Company’s Choir and Orchestra at Victoria Park, Haywards Heath. The CIC was established in September 2012 across the 20 schools in Haywards Heath and the surrounding area. It aims to utilise funding to create new and exciting opportunities for children across the 20 schools.